Will the Lastolite EzyBox pass our flash diffuser tests? Flash diffusers are great for ensuring more natural lighting in photos. They remove the harsh white light from direct flash by spreading out and softening light from flashguns. However, there are dozens of models available, each offering unique features. Which should you go for? We tested six of the best using a still-life setup, shot in front of a neutral wall using a tripod-mounted DSLR. The rigid camera position and single light source didn't eradicate shadows, but was ideal for showing how each product diffused and/or bounced the light. The flash was operated manually and its output was adjusted for each shot, to measure the degree of light loss each diffuser added. A series of portraits was also shot to assess the practicality of each model, and to gauge the positives and negatives of different diffuser types. But before we see which were the best flash diffusers, remember to consider the following points when buying a flash diffuser for your camera kit: size, compatibility, brightness, mix and match, and DIY. In terms of size, generally the larger the diffuser, the softer the light. Also make sure that the diffuser you buy fits the size or make of the flash head that you own. Remember that diffusing light will limit its brightness, usually by a couple of stops. When we say 'mix and match', we mean don't expect one product to deliver on all your needs. Reflectors, softboxes, domes, diffusers and honeycombs are different products designed for different situations. It's also possible to make your own diffuser. Believe it or not, an aeroplane sick bag and some tape does a good job! The Sto-Fen Omni-Bounce outputs light in all directions, and uses both walls and ceilings to bounce flash. Without these surfaces, the reflector is better used for spreading flash around. While this is great for fans of wide-angle and macro photography, it will cut a flash's equivalent output but still use the same battery power, so you might want to avoid leaving it fitted all the time. The Sto-Fen range is flashgun-specific, so while this means a faff-free, snug fit, you'll need to purchase a new diffuser when switching between flashguns. While £17 ($14) is a considerable amount to pay for a simple piece of moulded plastic, the Sto-Fen is great for spreading light. However, other products are better for softening it. What makes Rogue's line of FlashBender products unique is its ability to - you guessed it - bend into a variety of positions. An elastic fastener with Velcro edges makes adding a FlashBender reflector to a flashgun extremely easy. Once it's attached, the reflector's internal wire structure holds everything rigid until you reform the shape. This means bespoke positioning that gives you much more control over light than you'd get with a standard reflector - pinpoint light direction is easy. The Velcro sides mean a small snoot can also be formed. Bounce flash isn't as subtle as it is with softbox or dome products, but thanks to the FlashBender's small size and flat form when it's not on-camera, it's one accessory that's easy to take anywhere. Lastolite's EzyBox is a softbox-style product that's easy to construct. Like competitors, it fastens into place using Velcro strips that wrap around a flashgun. Although 'mini' by softbox standards, the EzyBox is still significant in size. With the front panel alone measuring 22 x 22cm, the overall dimensions easily make it the largest on test. While discretion might not be its strong point, it does a great job as a diffuser, and casts a more gentle light than any of the other products on test. This makes it perfect for portraits indoors or out. If off-camera flash is more your thing, a kit version comes with a spigot, foam handle and cord for about £90 ($138). The basic kit is £45 ($77) - a fair price for professional build quality. The semi-transparent Lightsphere Collapsible comes out of the box as a narrow, semi-transparent ring. A quick tug out and the three-sectioned, rubber-like construction forms its full 11cm height that promises gentle, diffused light thanks to a large surface area. Getting the diffuser on and off your flash head or adding the included dome can be a fiddly process. However, when it comes to versatility, the diffuser can be used in multiple ways to cater for indoor shooting, low or high ceilings and outdoor fill flash. When it comes to results, the Gary Fong Lightsphere delivers. The light cast is warmer than it is on other models, but the spread and diffusion of light is fantastic. It's great for shooting at functions and events. Honl Photo's medium-sized black/grey reflector can be rolled up to create a decent snoot (tunnel-like tube). This is where the product's strength lies. When it's used as a reflector, it doesn't quite compare to the likes of the Rogue FlashBender's unique design. The Honl also fails to deliver in a few other areas. For example, you have to buy a Speed Strap to make it work - that's a £9 ($10) Velcro strip that sits around the top of the flashgun. Despite this extra cost, the product doesn't then sit sturdily enough on the flash. There's also not enough rigidity to formulate any shapes beyond a standard 45-degree reflector. As a reflector, its ability to diffuse light is no better than that of more basic products. LumiQuest's Softbox III is up against some stiff competition in the diffusers field, considering that the well-made Lastolite EzyBox is available for a similar price. By comparison, the LumiQuest's simple four-panel construction forms well, although the method of adhering it to a flashgun with Velcro doesn't feel sturdy enough. It also means you need to have Velcro on your flash head even when you're not using the diffuser. But that's not to say that the Softbox III doesn't work. Far from it. 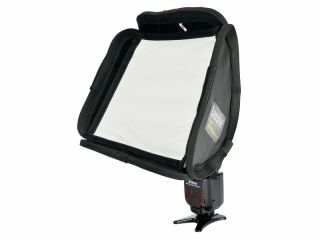 It's a decent enough performer for diffusing directional light, and the collapsible structure makes it portable, too. Shadows are softened and it's great for outdoor fill-flash work. It's just that there are better products out there.